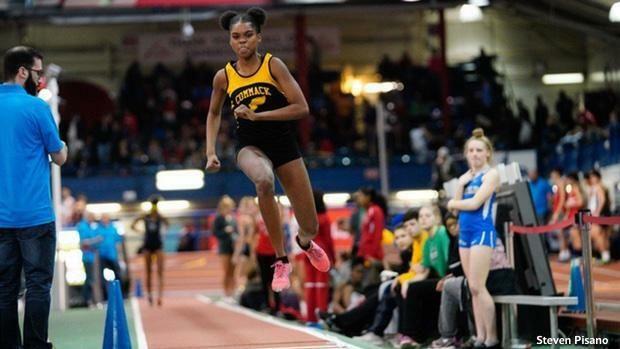 Commack High track coach Pat Hoover points to one of his first encounters with Alissa Braxton as the moment he knew there was something different about her. 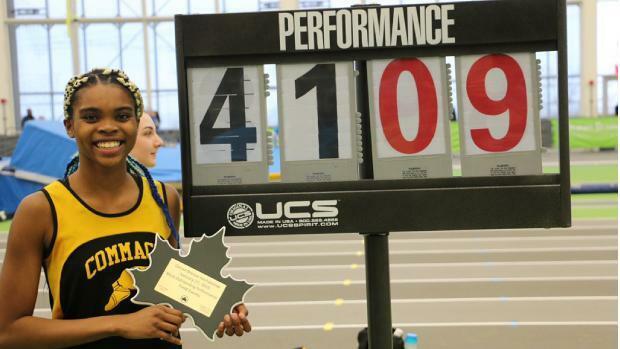 Braxton was a freshman at the time, far from being the New York State record holder she has become. The team was readying for a practice one day when Hoover was pulled away to speak to his athletic director about something. Before leaving his team to its own devices, he pointed to Braxton and said "Okay, you're in charge". "The team was stretching and rather than ask a captain to stretch the team, I pointed to Alissa," Hoover said. "She was a freshman and I didn't know her well. She just seemed like a silly, fun girl. I came back a half hour later and the whole team was dancing and clapping. She started dancing from the moment I left in front of 90 girls. They were taking turns and she had had every move in the book. It was great." "That told me something about her. She wasn't the kind of person to seek attention because she needed attention. She was just having fun and purely enjoying the moment. And that day she made herself accessible to everyone. She put herself on an even playing field with the seniors. That's the kind of girl you need on every team. She brings a lot of levity to our team and she also lets the girls know this is supposed to be a fun sport." Braxton, now a junior, danced her way onto Hoover's radar that day and hasn't stopped dancing since. 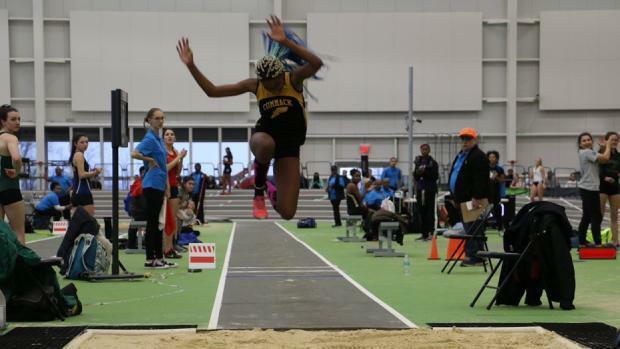 She's leapt, twisted and twirled her way not only to the top spot in New York State among triple jumpers, but has laid claim to the longest triple jump in the country this season. 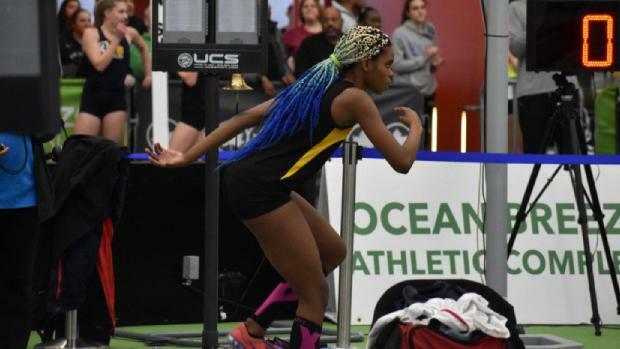 Her triple jump of 41-9.75 at the Ocean Breeze Invitational (Jan. 26) shattered the previous state record set by New Rochelle's Shenae Dawkins (41-8.5), who was also a junior when she set the standard in 2001. It was the longest jump in the country as of Jan. 31 and it also gave Braxton the nation's top combined triple- and long-jump distance (59-6.75). Braxton's leap of 17-9 in the long jump puts her just head of Perkiomen Valley (Pa.) senior Christina Warren (59-6) on the combined leaderboard. While the jump electrified the crowd at Ocean Breeze, it proved to be a bit surreal for Braxton, who had never received that kind of reaction from a crowd. She had jumped 41-2 in the trials, which was a new national high at the time, and as a result the building was buzzing as she readied for her final jump of the day. "I remember when I was talking with my friends, I told them I should get the power clap at Nationals but one of my friends said 'No, you're going to get the power clap today'," Braxton said. "They [my friends] got a few people going and that made me nervous. The announcer said my name and everyone was clapping [as I was getting ready to jump]. "I was thinking 'Oh my God, I'd better not mess this up'. I had so much adrenaline that when I went, I was really going for it. It pushed me to have a farther jump." Hoover tries to not wax poetic when it comes to Braxton and how far she has come as an athlete. After watching her at Ocean Breeze, though, it was difficult not to gush. The energy in the building and Braxton's personality made for a perfect combination. "It was refreshing and beautiful to see her confidence and skill level working hand in hand," he said. "She thoroughly enjoys what she does and she doesn't shut down [in big moments]. She just started running and the jump was unique, it was faster, the motion was quicker and her exit to the pit was so much more exaggerated. It was as if with all the excitement, she just exploded. "I don't think the jump was work. The crowd was part of all that. It was the first time she was ever motivated intrinsically. She never had that kind of fanfare outside of her team. It was the first time the whole crowd was looking at her." While Braxton set the record on the leap, she wasn't completely satisfied with her effort. She pointed out that she was a little short on her first phase of the jump and that she has to work on being more consistent. She'll have plenty of time to work on it between now and March 8-10 when the New Balance Nationals Indoor Championships will be held at The Armory. Still, Braxton has her sights set higher and believes that what she did at Ocean Breeze is a preview of greater things to come. "I remember my coach telling me last year that we should try to get 40 [feet] by my senior year," said Braxton, whose cousin is seven-time Grammy-winning singer Toni Braxton. "I thought 40 is a good number. Then it happened this year and it was like 'Oh my God, I can go further than 40'. My goal before was between 40 and 41 but now I'm thinking 42-43. I think I can get there, I'm just three inches away." Just think of the dance Braxton will doing if she hits that mark.